AMF - Jim Oldiges, "Mr. Meticulous"
Jim Oldiges (pictured above) was born in Toldeo, Ohio in 1956 and graduated from Toledo Central High School in 1974. Prior to graduation he had already signed up for the Marines, which he served until the end of 1980, followed by another two years in the active reserves. 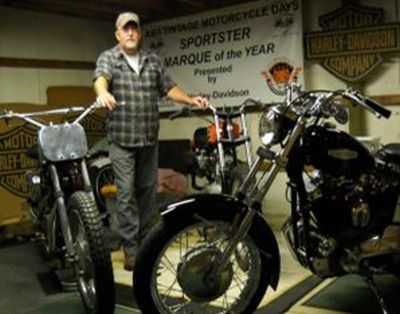 Oldiges' collecting gravitated toward Harley-Davidsons, which are the core of his collection still today. Over the years he has owned seven of the MX250 motocross bikes, dozens of CR, CRS, and ERS Sprints, ten XR750s, and even two or the rare RR250 Aermacchi road racers. 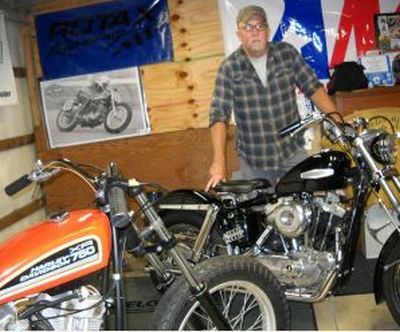 Current builds include a 1968 XLR (#8 of only 15 built that year) (pictured above right) and a 1980 XR750 (pictured below left). 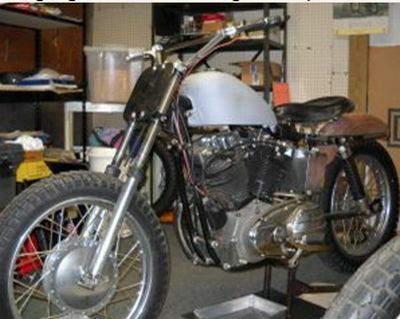 About the current XR750 restoration he says, “There's a lot to work with. 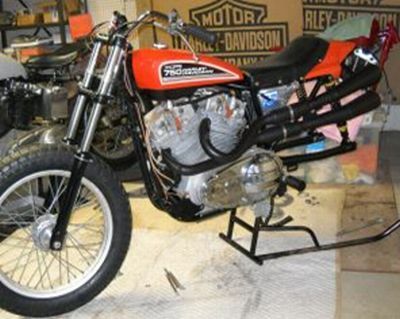 The engine was once installed in a hillclimbing chassis where it got very light use, so this is a nearly new motorcycle that has never seen duty on a dirt track.” Whether it will ever match his 99.75-point 1972 still remains to be seen. Not surprisingly, Oldiges' meticulous restorations have not gone unnoticed by the many museums that are assembling motorcycle exhibits these days. At present, he has an authentic Terry Poovey Harley-Davidson—with engine built to full racing spec by Teddy Poovey—at the Motorcycle Hall of Fame Museum in Pickertingon, Ohio, and his near-perfect XR750 used for Willie G's Eyes on Design ceremony is now on display in the foyer of the Antique Automobile Club of America Museum in Hershey, Pennsylvania (pictured right). In addition, at the Harley-Davidson Museum in Milwaukee there are two Oldiges machines, a 1972 Sprint ERS and a 1974 SR100 Baja. As for how Oldiges affords his hobby, consider the fact that at age 53 he commands a good fee because he is still an active tree climber in a trade where skill and courage have been almost entirely replaced by trucks and buckets. So who says motorcycles don't keep you young at heart?